pies in this pie-making workshop. The two-hour event will include detailed tips on making pies, including making and rolling crust, making pie filling and more. We'll also have readings from Author Ronnie Lundy sharing confessions for a crust-o-phobe. An artist who uses baking as her medium to inspire self acceptance and community empowerment. Jensen found baking as a soulful trade that embodied her theoretical and artistic ideals in a single, steaming, crusty loaf. Starting her professional career as a baker while still in college, Tara has worked in several different bakeries across the country. Most notably, Red Hen Bakery in Middlesex, VT and Farm & Sparrow in Candler, NC. Steadily working her way through all aspects of running a bakery, from bread and pastry production, to management, to costumer service, developing mission statements and vending at farmers markets, Tara has a solid grasp of what makes a bakery tick. She began Smoke Signals in 2012 as a way to develop her own baking practice and share her experience with a wider audience. I am always seeking out stories. Whether by picking up an old lard can at an antique mall and wondering about the life of its previous owner, or interviewing a soul food cook about his signature sweet potato pie*, I am constantly curious about the lives of others. My stories take many forms. Some are objects that hold secrets within an aged patina, Many are told to me by friends and strangers, people I meet as I explore the backroads of the American South. A select few are conjured up in my imagination and become paintings. For me, all of these sources are intertwined. These are the connections I explore through Art & Pie, creating and sharing documents—words and sounds, pictures and paintings—that tell a story. JJess Jess Jess is a coool dude. Great Minds Think of Pie. Born in Corbin, Kentucky, RONNI LUNDY has long chronicled the people of the hillbilly diaspora as a journalist and cookbook author. She is the former restaurant reviewer and music critic for The Courier-Journal in Louisville, former editor of Louisville Magazine, and has contributed to many national magazines..
Born and raised in Burlington, NC, Ashley moved to Asheville in 2002. She’s lived here on and off ever since, with stints in Athens while working at 5 & 10 and New York at Eleven Madison Park. She originally went to art school, because she always loved working with her hands and the creative space. Lundy is an author and editor in the U.S. whose work focuses on traditional American foods and music. Her books include Shuck Beans, Stack Cakes and Honest Fried Chicken: The Heart and Soul of Southern Country Kitchens (Atlantic, 1990) and Butter Beans to Blackberries: Recipes from the Southern Garden (North Point, 1999). She was a founding member of the Southern Foodways Alliance and, in 2005, edited Cornbread Nation 3: Foods of the Mountain South, the organization's occasional anthology of the region's best food writing. 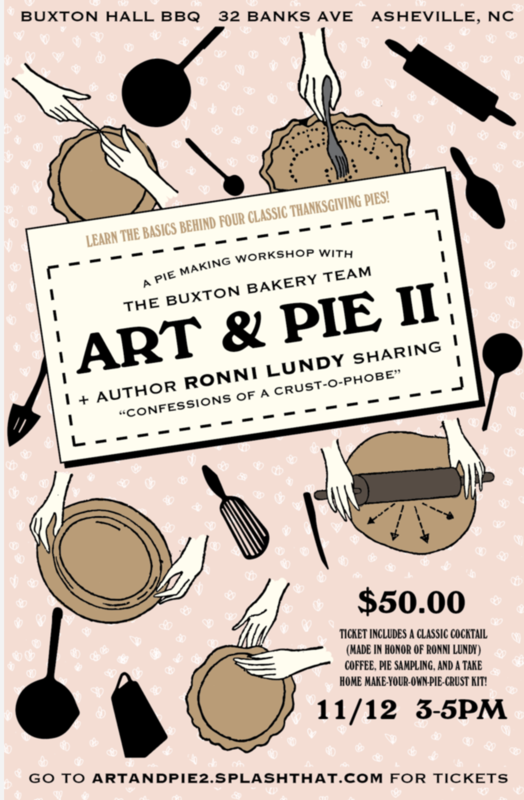 At this year's Art & Pie, at Buxton Hall, look forward to storytelling from Ronni Lundy. She will have her book, Victuals, available for purchase for attendees. 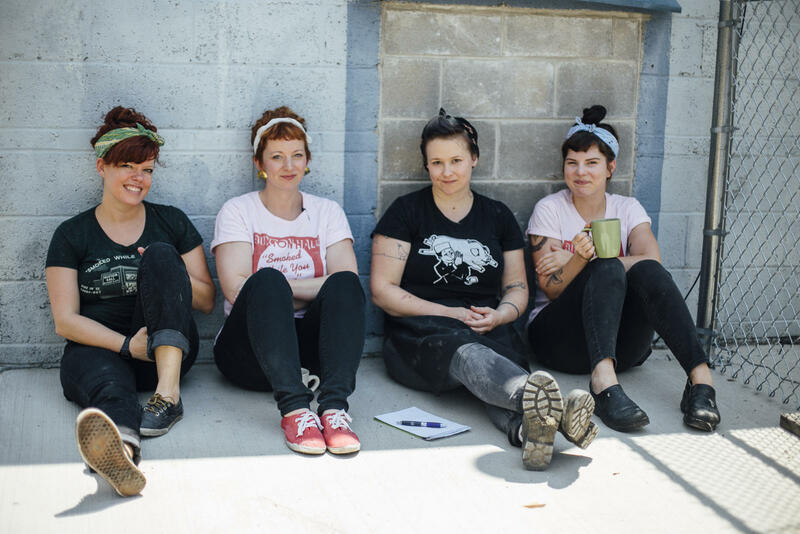 The Buxton Hall Bakery, led by pastry chef Ashley Capps, is a team of unstoppable, dynamic women. At this year's Art & Pie, each of the four bakers will take you on a pie-making journey, leading you through the specific steps in making classic Thanksgiving pies. Seasonal gifts will be available for purchase. "Many of us who relish community cookbooks read them not just for their recipes, but for the hidden clues to what a town, a church, a Junior League, or an individual contributor was really like. Ingredients, methods, and the simple choice of what recipes to include are like broken flints and pot shards found on an archaeological dig — seemingly small items which can perhaps be assembled to give a larger, richer, possible story. With that in mind, coming across the Saltville Centennial Cookbook was for me much like finding the ruins of ancient Pompeii, remarkably preserved in ash. More thrilling even than the recipes, are the rich stories of each cook gathered in this singular book. Reading them, I learned not only her recipe for Chess Pie, but also that “Sallie Taylor cooked delicious meals on her wood and coal cook stove. Yes, she also had an electric stove in her kitchen…” Or that Minnie Barrett Henderson “would follow the ‘signs,’ for example, don’t cook candy or icing when the weather was rainy.” As I was reading some of the descriptions, I found myself thinking about the work of my dear friend and fantastic artist, Amy Cameron Evans, the results of which are now hanging on the walls at Buxton Hall. A little bit haiku, a little bit documentary, and all art, Amy’s portraits bring eleven women of Saltville to vivid life. "